In our last article, we talked about some streaming options for your house. For in home streaming of your own local files (anything from downloaded stuff, pictures, music, etc), there are many options, Windows Media Center, XMBC (and other flavors of it like Media Portal), etc, that go above what basic DLNA gives you. We have tried and ran most of them.. while all of them were great, wonderful interface, etc.. many were not always easy to set up, etc. That is one place, where PLEX stood out. You have TWO options, for running your Plex Media server. PC based or on a NAS. PC supports installation on Windows, Mac, 3 flavors of Linux and FreeBSD. NAS wise, can install on Netgear, QNAP, unRAID, drobo, asustor, Synology. Compared to the others.. Setup is relatively simple and straight forward, most users can do it on their own. Management is done, through a simple web interface… that can be accessed from the PC its installed on, but also is its own small web server, so can be accessed via the IP(and port) of that device on your local network. To play back media FROM the Plex server, you have a HUGE range of options. 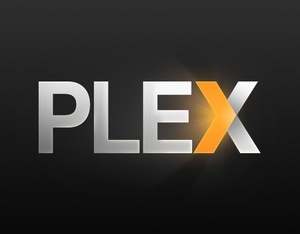 There is also the option for the PC version, called Plex Home Theatre, which can be run on a HTPC or any PC at all, on a separate one from the server or the same. Worse case scenario, if you have a device which can not do any of the above.. Plex will also run as a DLNA server as well. Plex playback software is pretty smart, and will go out and find any server on the local network you are on, no having to enter a server address, etc. Plex can take the connectivity a step farther.. and extend it OUTSIDE of your house as well. This require some port forwarding on your Router end.. but by doing so, and creating a login (which you sign your server and playback devices in with)… you can now access your media center, via any Plex app logged in as you, from anywhere else. You can get access to the management interface from external. (which actually DOES do playback via the web browser as well). Plex mobile, etc apps, can access the media for playback as well, on wifi, cellular, etc. We have helped set up a number of people with a PLEX solution.. and with a decently organized library to start… you can be fully set up, sometimes within 30 minutes or less! Yes, quite the BROAD topic, I know. Streaming media (from things like Netflix, etc), as well as local media playback, it becoming larger and larger, and more and more people are integrating this into their home setup. This one will be just more of a BROAD overview on some of the different options available to users, to get them started. We likely will publish some other articles, about specific ways, specific devices, etc as it goes on. We will cover over TWO major areas on these. STREAMING, and Local Playback. Smart TV’s are likely the most simplified option. 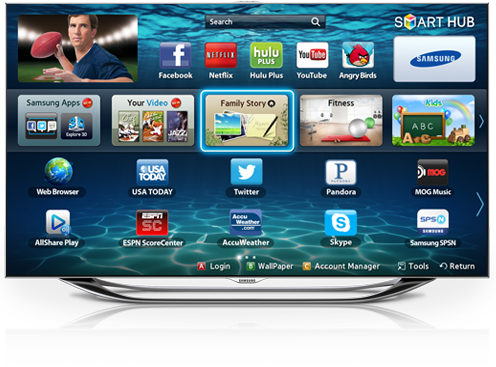 Its an all in one option, where the TV has a set of software apps on it (like seen in the picture above). You connect it Wired or Wirelessly to your internet connection. The only downside occasionally to the smart TVs, is that the APPS seems to get updated LESS than on other devices, and may go out of date or incompatible quicker. There is a myriad of these boxes out there, impossible to list them all. 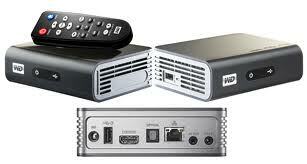 Some of the more popular and known ones are things like the WD Live/TV or the Roku. There are also many ANDROID based ones, which run similar to an android tablet based OS. Like the TVs they connected wired or wirelessly to your internet, allowing you to do the following. Play back Local media – this can vary from unit to unit. Some like the WD above, does have a USB port, many do not. These usually have a very small form factor and take up very little space, but is an easy way to add the connectivity to an HDTV which doesn’t have smart capabilities. The Apple TV actually falls into this category mostly. It really doesn’t allow much local playback at all, mostly just streaming capabilities. BUT, local playback can be done from a iPhone/iPad with it, as it falls also into the next category. These are devices, which you CAST or THROW your content often to them. They have very little built into them, that most of all the legwork is done by your phone or tablet, then it is shared across to the TV. Really, its acting as a wireless bridge to your TVs input. What you do, is start up the content.. a file loaded onto the phone or one you are say streaming from a home source (DLNA, etc), or a streaming source like Netflix… then these devices MIRROR what it on the screen of the phone and play it back then on your TV. They are one of the CHEAPEST options out there, and take up virtually zero space. But they do require the usage of a phone or other deice to run, stream, etc the content. A HTPC can be any number of things. From a full size desktop tower, to a laptop… all the way to ones that are designed to LOOK like stereo equipment, or ones that are small like the Roku, etc (like pictured above). 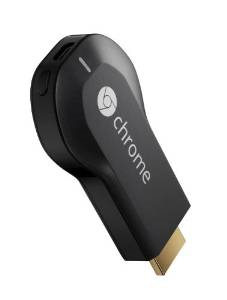 Virtually ANY PC connected into the TV, can act like a basic HTPC, playing back anything you chose to view on the screen. But taking it the next step and more dedicating it, with a few pieces of software, it can become a very powerful playback device. Play back of local media – well it is a computer, you are likely just loading/storing on it anyways. Plug in any USB key or hard drive. These devices can be used just as a playback device only (if local media is stored elsewhere), or can even become the SERVER or storage space for that local media as well, which then can share out to OTHER devices within the household. Using windows 8 on a HTPC also can add the level, that it has windows 8 apps for many things like Netflix, etc, making it a more seamless interface much like the smaller streaming boxes. PC’s can also on the SUPER advanced end, get into recording, recording and sharing over the air signals, etc.. but that’s a whole other ballgame. Obviously you could move your media from room to room with you, via USB key, etc. But overall the easiest way, is to serve it from one central location. DLNA is probably the most simplest. Its a standard, which many devices conform to for access, etc. Its pretty much just one step above direct file level access. Usually the media is just browsed by folder (however they are stored/sorted) or basic separation, using the regular file names, etc. A simple setup even in a program like Windows Media Player, will allow sharing of its library via DLNA. 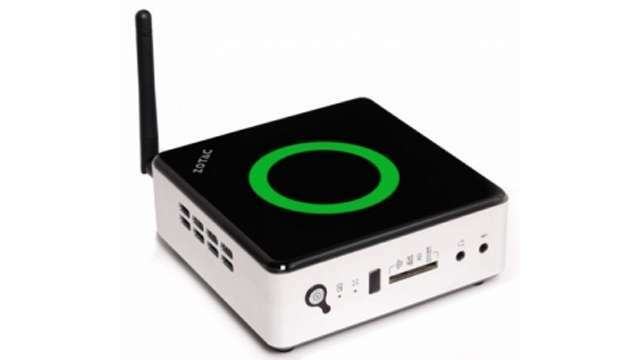 There are also other devices, like external network hard drives or NAS storage devices, which can also allow DLNA service directly from them. These devices can be nice, that you don’t have to have a PC on all the time, just a network storage connected somewhere. Going past DLNA, you can get into the more advanced methods. Things like a full fledged XMBC server or Plex (please see our article on PLEX release later), take it to the next level. They will scan your media library, but they then create their own database of what you have. They will go out to the internet, and collect information on the movies, shows, music, etc, and download things like cover art, descriptions, etc. In the end, it gives you a Netflix like interface, for your own personal media collection. Some of them, like plex, have a connection interface that spans PC, phone/tablet, so you can access the media everywhere. These types of server, can often be used on a NAS, and set up on a PC. No matter which way you go, this is becoming a BIG thing now. With much content being made available via streaming services, people are often obtaining via those methods, as they can then access them across many devices. Services like Netflix and other streaming services are growing and growing.. and things like these are not going to disappear, and only become more and more mainstream in every household.